You thought Google+ was dead, didn’t you? And it is — if you’re a consumer. But the business version of Google’s social network will live on for the foreseeable future — and it’s getting a bunch of new features today. Google+ for G Suite isn’t all that different from the Google+ for consumers, but its focus is very much on allowing users inside a company to easily share information. Current users include the likes of Nielsen and French retailer Auchan. 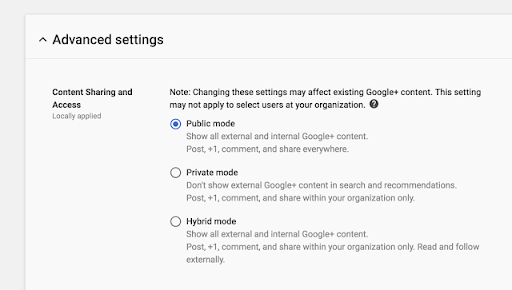 The new features that Google is announcing today give admins more tools for managing and reviewing posts, allow employees to tag content and provide better engagement metrics to posters. Recently Google introduced the ability for admins to bulk-add groups of users to a Google+ community, for example. And soon, those admins will be able to better review and moderate posts made by their employees. Soon, admins will also be able to define custom streams so that employees could get access to a stream with all of the posts from a company’s leadership team, for example. As far as the new metrics go, there’s nothing all that exciting going on here, but G Suite customers who keep their reporting structure in the service will be able to provide analytics to employees so they can see how their posts are being viewed across the company and which teams engage most with them. At the end of the day, none of these are revolutionary features. But the timing of today’s announcement surely isn’t a coincidence, given that Google announced the death of the consumer version of Google+ — and the bug that went along with that — only a few days ago. Today’s announcement is clearly meant to be a reminder that Google+ for the enterprise isn’t going away and remains in active development. I don’t think all that many businesses currently use Google+, though, and with Hangouts Chat and other tools, they now have plenty of options for sharing content across groups.